Each rosette is individually made with very slight variation in design. 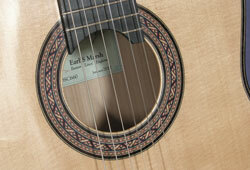 The outer & inner circles of the rosette are the same as the purfling around the edge of the soundboard. 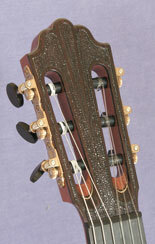 The Brazilian rosewood bridge has six double holes in the tie block providing for good break angle and easy tying of the strings. The saddle tie block and the saddle are black horn. 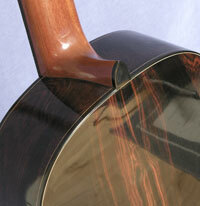 The stunning looking back and sides have Defra cites certification. This new model took many months in development. The 'Kermodie' Lutz spruce soundboard is braced with my own design longitudinal quadrate bracing which provides for amazing balance over the strings. 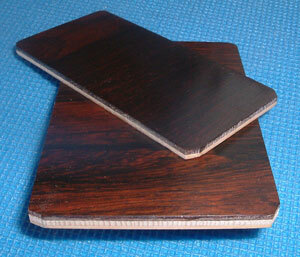 The sides are of a double laminate and the back of a triple laminate as can be seen in the description below. 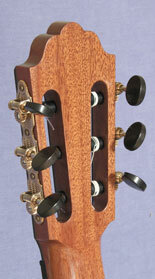 Erving Sloane tuners with ebony buttons. The top nut is black horn. 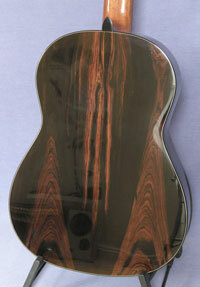 Inner 2.0mm Spanish cypress, outer 2.0mm Brazilian rosewood. 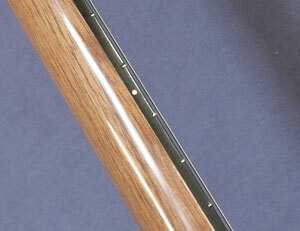 outer 2.0 mm Brazilian rosewood.